It was raised on several occasions in last weeks’ HIV/AIDS posts here and here, and this article at Wired (Artist Builds Temple of Science) makes the “science as religion” accusation tangible. You know what you really want in good science, you want it to stop getting complex as soon as it begins to be confusing to any typically insightful, average human being with a moderate education and intellect… If science says something that appears contrary to experience… oh… I don’t know, something like: “The sun does not rise and fall, it simply appears to” — then science needs to back off so regular folk can go on being comfortable in their modicum of understanding. I have to admit I only learned about George Obama — Barrack Obama’s half-brother currently living in Nairobi, Kenya under, it seems, rather poor conditions — from Dinesh D’Souza’s blog. This CNN clip will give you some background. 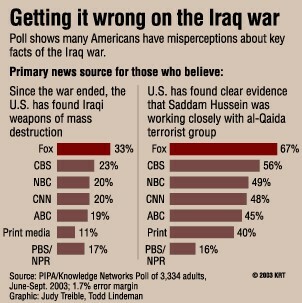 This sort of misinformation isn’t hypothetical; in 2003 a study found that viewers of Fox News were significantly more misinformed about the Iraq war, with far greater percentages of viewers erroneously believing that Iraq possessed WMDs or that there was a credible link between the 9/11 attack and Saddam Hussein than those who got their news from other outlets like NPR and PBS. This has led to the rise of websites like FactCheck andSourceWatch.